Few people would guess that the history of today’s busy John Wayne Airport stretches back nearly a century. 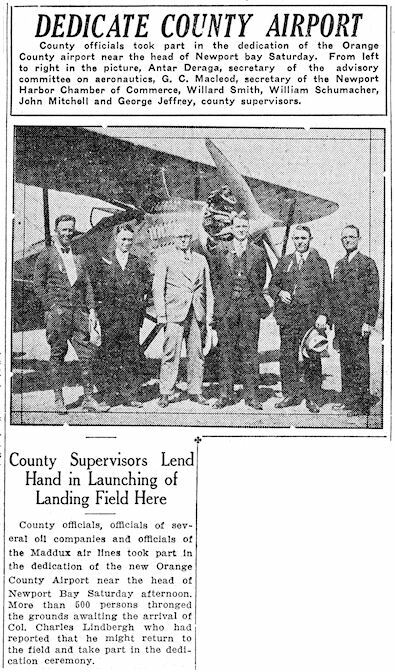 It was all the way back in 1925 that Orange County began acquiring property for its first county airport. Actually, the original plans called for an airport and sports complex, with baseball and football fields and a racetrack. Not that the county was ready to make a big commitment yet. They cut a deal with James Irvine to buy 40 acres a year for four years (that first 40 acres, by the way, cost them $14,000). So it was not until early 1928 that they had the 160 acres they needed. A few weeks later, on April 7, 1928, the Board of Supervisors dedicated the original Orange County Airport. That first county airport was actually located northeast of today’s airport (the 405 freeway now cuts through the site). Development was minimal, running mostly to a dirt runway and a windsock. It seems to have been used fairly regularly for about a year, but could never draw too much traffic away from Eddie Martin’s private airport, which had opened five years before. But there was a problem. Martin’s airport was located at the south end of Main Street where it met the old Newport Road (later the route of the 55 freeway). By the mid-1930s, the county was already planning to extend Main Street down to the Coast Highway to create what we know as MacArthur Blvd. today. But that meant Martin’s had to go. To make it up to them, the county agreed to give the Martin brothers a seven-year lease to run the county airport. But not the 1928 airport. In 1939 the county did a swap with The Irvine Company for a different site, a little west of the first location. Construction began early in 1941 on the first two runways, an administration building and control tower, and a hangar. The whole thing only cost about $50,000. These were the first two paved runways in the county. 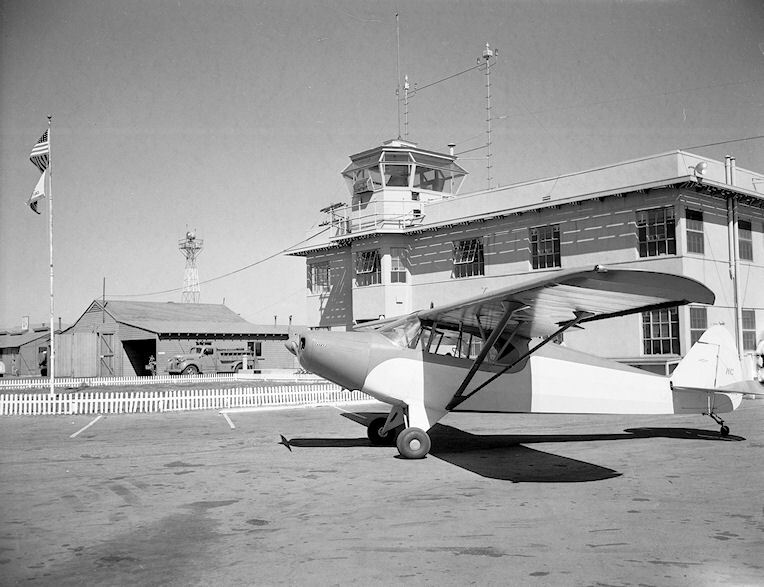 The second Orange County Airport opened for business on August 15, 1941. Less than four months later, America entered World War II. Shortly after the attack on Pearl Harbor, the Army Air Corps took over the county airport, which they dubbed the Santa Ana Airdrome. They extended the runways and built a number of new buildings and barracks. The Orange County Airport was finally returned to the county in 1946. The Martin brothers had expected to take charge again, but after all the Federal money they had spent on improvements, the Army ruled that no one company could control the operations. So Martin was just one of several firms who negotiated leases, and the county hired their first Airport Manager, Bill Nichols. He had a staff of four in those early years. Bonanza Airlines began Orange County’s first regularly scheduled passenger service in and out of the Orange County Airport in 1952. A new terminal was completed in 1967, and in 1979, on a motion from Supervisor Tom Riley, the airport was renamed John Wayne Airport. When the current terminal was completed in 1990, it in turn was named for General Riley. By then, ten different airlines were offering passenger service in and out of the county, and the airport had grown to over 500 acres.